Tramadol is a non-narcotic pain medication that is designed to work like a narcotic by blocking pain signals in the brain. It does this by attaching to the opioid receptors in the brain—the same ones that are stimulated by narcotic opiate-based medications. It is purely synthetic and does not contain any opiate-based ingredients; it is considered to be safer and less addictive than other narcotic medications that relieve pain. 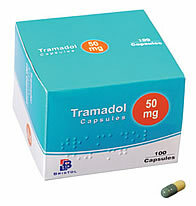 Tramadol is available in standard and extended-release tablets, ranging in dose from 50mg to 200mg. As with many pain relievers, the smallest dose that provides effective pain relief should be used for the shortest amount of time possible to avoid adverse side effects. Tramadol is used for moderate to moderately severe pain in adults, but it has very little effect on nerve pain or other disturbances of the central nervous system. It is generally prescribed when patients do not get the desired relief from less potent pain relievers as a medium between these and stronger narcotic medications like Percocet and Oxycodone. Medications like Tramadol should be prescribed for as short a time period as possible to reduce possible side effects, but extended release formulations are available for conditions that require around-the-clock pain management. Many patients respond favorably to the drug while others require different types of medication for adequate pain relief. Tramadol is a synthetic analog of codeine. It inhibits the reuptake of norepinephrine, induces the serotonin release and acts as a μ-opioid receptor agonist. This means that it binds to the μ receptors of the cells and triggers a number of effects, the most important of which is pain alleviation. It changes the way the body perceives pain. In general, it makes the nervous system less sensitive to pain. To some extent its effect is similar to this of endogenic endorphins which are natural pain-killers. It belongs to the same group as morphine. However, its affinity to the μ-opoid receptors is 6000 times weaker than that of morphine. This means that it is a weaker pain-killer but the occurrence of side effects is also less common. It also interacts with the serotonin metabolism, increasing in this way the pain threshold. There are certain conditions when the usage of Tramadol should be avoided. Although Tramadol has a mild potential of causing addiction, patients that are prone to drug abuse as well as patients with history of alcoholism should not be prescribed Tramadol. Special attention should be paid to patients suffering from epilepsy. Tramadol should be avoided in the treatment of such patients as it makes the occurrence of seizures more likely. Patients with history of seizures have to inform their doctors if they need to be prescribed a pain-killer. Precautions should also be taken in the cases of renal or liver dysfunction or failure. Then the prescribed dosage should be decreased. As Tramadol dilates the brain vessels, it should be used very carefully in cases of head trauma or increased intracranial pressure. The combination of serotonin reuptake inhibitors (drugs used for treating depression) and Tramadol can increase the risk of serotonin toxicity. Tramadol should not be used together with MAO inhibitors (antidepressants). Patients that have been on treatment with MAO inhibitors for the last 14 days should also not be prescribed Tramadol. Driving a car while you are treated with Tramadol is not advisable. The usage of Tramadol by pregnant women is not recommended. They can be treated with it only in the case of extreme emergency and under strict control. It has also to be avoided by breast feeding women unless it is taken in a very small dose and under medical control. An opiate analgesic medication, morphine is a narcotic pain reliever that has been used throughout medical history. It was first sold commercially in 1827, but had already been distributed privately for 10 years. Oxycodone, known by the brand names Oxycontin & Roxicodone, is an opioid pain reliever available by prescription only. Vicodin is composed of the primary ingredients acetaminophen and hydrocodone bitartrate and is most commonly used to treat short-term pain associated with an injury or surgical procedure. Ibuprofen, which is more commonly marketed as Advil and Motrin, is a non steroidal anti-inflammatory drug (NSAID).